George Sosnak is the king of the "painted ball" as an artistic medium, so whenever an example pops up featuring a Dodger player I have to share it. Available at Hunt's current MLB All-Star FanFest auction is a grouping of original Sosnak Baseballs from his estate, and featured above is an unfinished 1988 LA Dodgers World Series ball showcasing Orel Hershiser on a panel. Check out the auction here. Hand painted baseball decorated across two panels with "1988 World Series Champions" decor on one side and MVP Orel Hershiser on the other panel. The adjacent side panels has been signed by Hershiser in blue ink rating 8 out of 10. Other side panel has faded signature of Tracy Woodson. I do not know why Tracy Woodson's signature is on the ball. He didn't record a hit in four at-bats during the Fall Classic, but he was an instrumental piece of the vaunted "Stuntmen" bench corps that helped drive the club to a championship that season. Of special note, numerous unfinished examples of Sosnak's work have recently made it onto the market. When he died in 1992 a large cache of Baseballs that he never got around to completing were found. The ball above is one of those balls obtained directly by a Sosnak family representative and offered here for the first time. George Sosnak was one of the earliest recognized artisans to use a Baseball as his medium. In 1956, during his time as an umpire in Pioneer League, he fulfilled a fan request for a painted Baseball. Soon, his work became legendary, and everybody under the sun requested his work. Notably, he rarely turned down a request, and often gave the balls away as personal gifts. Sure, he got paid from time to time, but that wasn't his motivation. 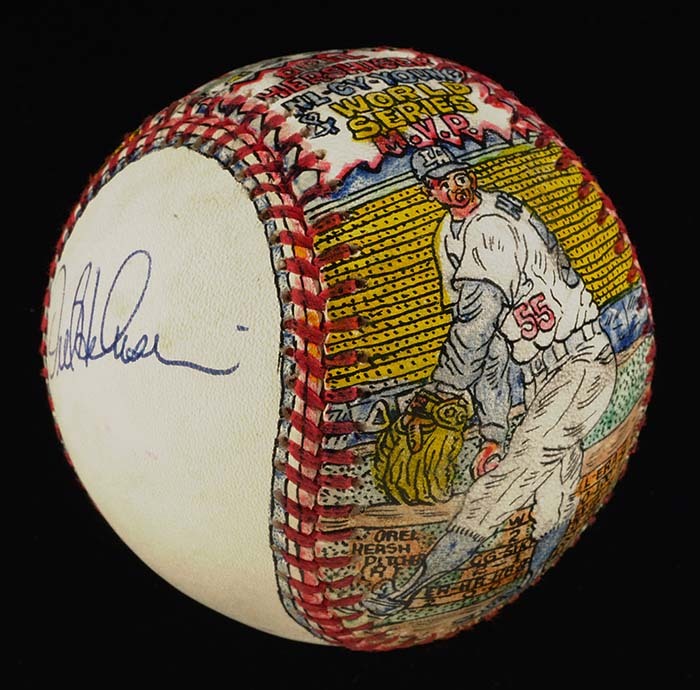 He needed an outlet, and painting on Baseball's became it. His work can be found at the National Baseball Hall of Fame in Cooperstown, the American Folk Art Museum in New York City and the John F. Kennedy Presidential Library (it includes a ball commemorating JFK’s Opening Day pitch at a 1962 Senators game). 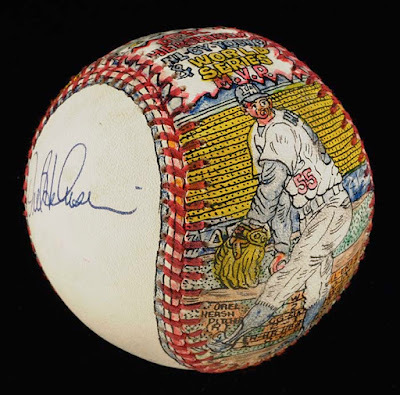 All said, he has painted at least 800 Baseballs; while other estimates put the number as high as 3,000. Dave Bailey wrote a great article about George Sosnak at Sports Collectors Digest that is worth a read. Check that out here.